Looking for Indoor Cable Protectors? Outdoor cable protectors can keep cords safe in high traffic areas during construction or for can be used for events, like concerts. Cable protectors will prevent falls and trips from happening at social gatherings. Most people are not aware of the hazards cables can impose if not covered properly. Driving over cables can cause the outer coating to become worn and exposed wiring is dangerous. Event goers can also be hurt by tripping over cables in tight spaces and by not easily seeing them. Any price point can be met and quality is never an issue. The External Budget Cable Protector can be used in construction areas and outside events. 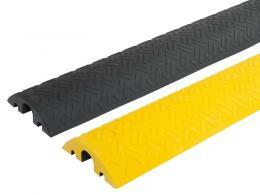 Construction of the cover is derived from tough rubber and has been thoroughly tested in many traffic situations. Any amount of weight can be handled. A convenient access point is located at the top of the cover for easy installation and removal of cables. The product comes in 10 metre rolls and can be cut down to the required size. The Pedestrian Cable Cover is imperative for any location where there is a great of people on foot. Having a colour scheme that is easily visible will ensure less trips and falls. Large cables can be inserted, up to 30mm. The lid is plastic hinged and is weatherproof. Construction of the product is derived of heavy duty rubber. This cable cover is not recommended for vehicles and is outstanding for concerts and festivals. 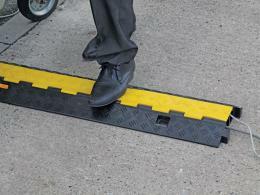 The External Heavy Duty Cable Protector can be put together quickly for construction areas and outside events. Mouldings can be interlinked to make a continuous ramped cover. A hinged lid will enable cables to be inserted after the ramps have been placed. If a permanent place has been set, bolt holes are provided for easy installation. Three channels are available for different size cables, up to 65mm for width. 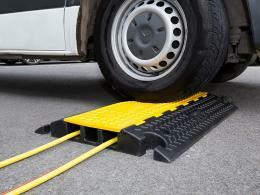 The cable protector has been road tested with heavy wheeled vehicles, up to 6000kg. The unit is highly visible and constructed from heavy duty rubber. Do not use with fork trucks and heavy point vehicles. Having an External Industrial Cable Protector will ensure cables will be safe from heavy wheeled vehicles. 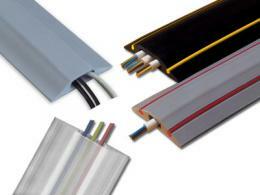 This product has specifically designed to cover heavy duty power cables, even in harsh conditions. Safety codes have been thoroughly tested and the cable protector is non-conductive to BS903-C5. Being fire retardant to BS476 Part 7 Class is another great attribute of the product. The cover is easy to install and does not need to be fixed to the ground. 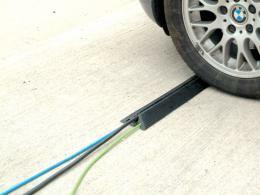 For a fast and temporary solution, the External Cable Protector can be utilised. 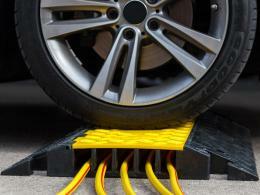 The cable protector doubles as a traffic speed bump and is flexible. The unit can be easily moved and used in other locations. Construction of the cable protector is derived from heavy duty rubber. The diameter of the opening is 53mm and the product is highly visible. 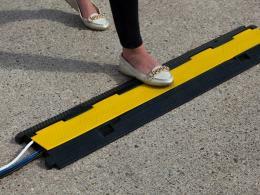 The cable protector can be used in road traffic areas and on pavements. Our products are high quality and have been well tested, ensuring the life of the item. Taking preventive measures will help prevent accidental trips and falls at events. Cables will also be protected and secured from being destroyed. In traffic situations, cables will continue to function properly. Taking small measures will aid from bigger problems happening later.